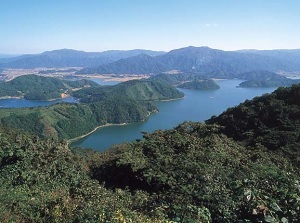 Mikata-goko is the area with five small lakes, and is located about 20 km west-southwest of Tsuruga city. These lakes are near Wakasa Bay, and all lakes are connected with a narrow channel or a canal. The lakes are the followings. 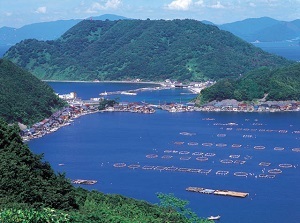 Lake Kugushi and Lake Hiruga are connected with Wakasa Bay. Urami Canal connecting Lake Suigetsu and Lake Kugushi was constructed in 1664 by artificial means. 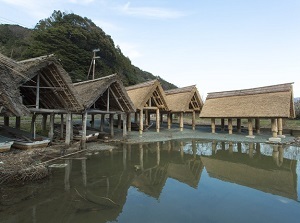 And Lake Suigetsu and Lake Hiruga wre connected with an underground waterway constructed in 1934, but it is always closed to avoid the water quality change. All lakes have different concentrations of salt. Of course, the nearer the sea, the higher the concentration. But deep Lake Suigetsu is unique. The layer from the surface to about 6 meters deep has freshwater, but the deeper layer has oxygen-free brackish containing hydrogen sulfide. To enjoy the scenery of these lakes, we can use a pleasure boat and a scenic road. High-speed pleasure boat sets off from the nothern lakeside of Lake Kugushi once an hour. 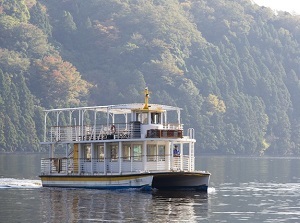 The boat cruises four lakes except Lake Hiruga. It takes about 40 minutes. The scenic road is "Mikata-goko Rainbow Line", and runs on the ridge of the mountains in the north side of Mikara-goko area. The total length is about 11.2 km. There is Mount Baijo (395 meters high) to the north of Lake Suigetsu. On the top of the mountain, there is the park of the observatory. 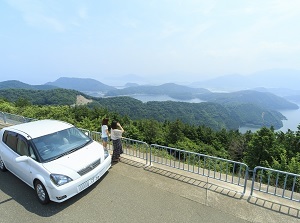 We can see the lakes of Mikata-goko and Wakasa Bay. 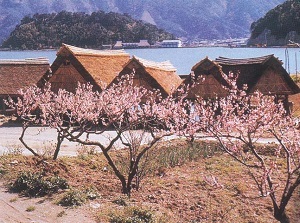 Around Mikata-goko, many ume (Japanese apricot) are cultivated. Beautiful ume blossoms are full from late February to early March. And umeboshi (pickled Japanese apricot) and the other ume products are sold around this area. Mikata-goko has been inscribed as a registered wetlands under the Ramsar Convention in 2005. By JR Obama Line, get off at Mihama station. About 22 minutes from Tsuruga. By taxi, about 7 minutes to the boarding port of the pleasure boat, about 30 minutes to Mount Baijo. About 20 km from central Tsuruga city to the boarding port of the pleasure boat.